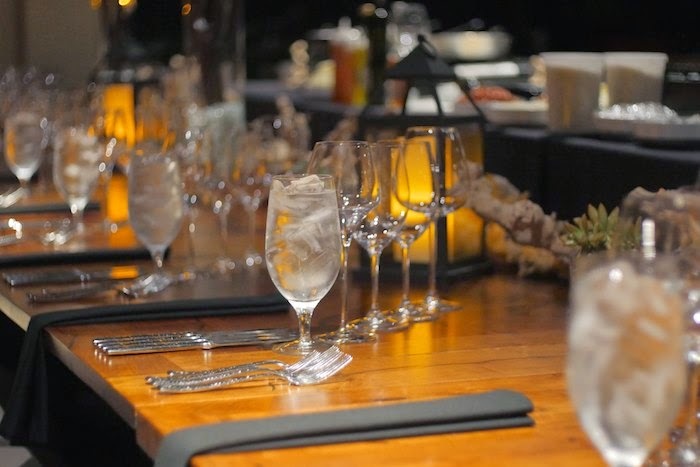 Even though I've attended many wine dinners over the years I've never experienced anything quite like Different Point of View's, "Insider's View Wine Dinner." 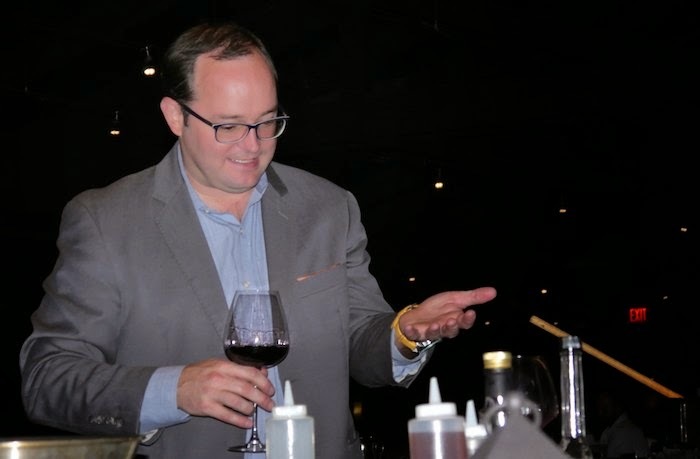 What sets the Insider's View Wine Dinner apart from the rest? 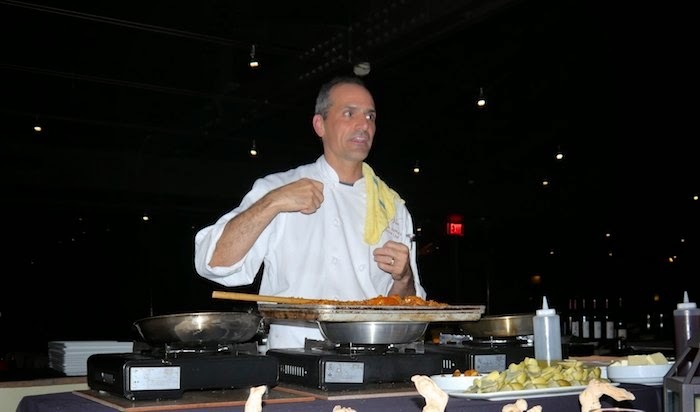 The intimate setting for one thing and the fact that Chef Anthony DeMuro prepares dinner table-side for a mere 12 people. Held once a month from September through May, these highly regarded dinner are nothing short of spectacular. 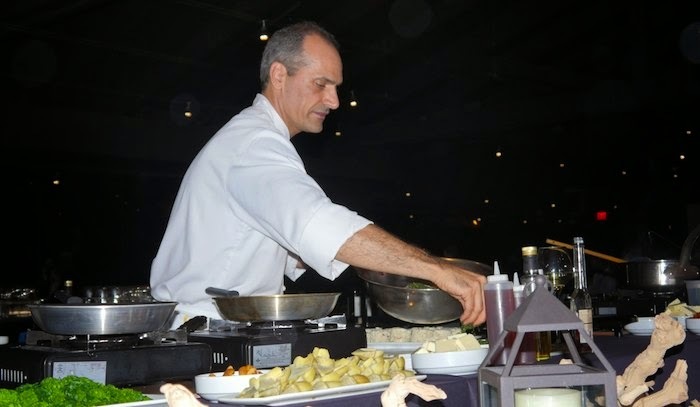 The evening is kicked off with a wine reception under the stars; where foodies and wine enthusiast can mingle while feeding their appetites with tasty hand passed bites. The main event takes place inside the the restaurant. A cooking station is set up allowing Chef DeMuro to interact with guests as he expertly prepares the evenings meal. It's a perfect time to get your questions about meal preparation and wine pairing answered. On hand the night we attended, was Erik McLaughlin, owner of Seven Hills winery. Prior to each course Erik discussed the wine that was to be poured; providing history and tasting notes. Seven Hills Winery in Walla Walla was established in 1988, is one of the oldest wineries in the area and is known for their Cabernet. 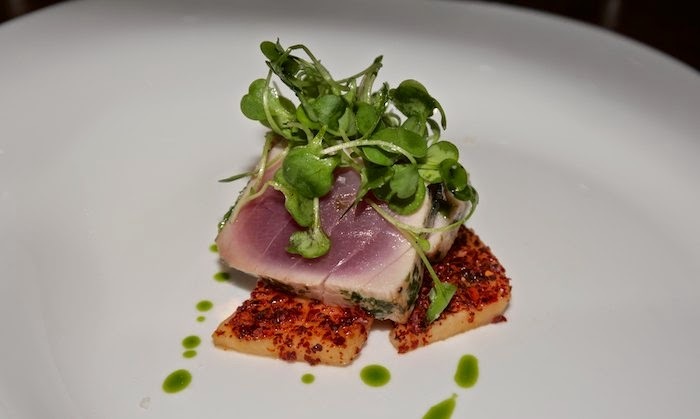 Our first course was a seared Ahi Tuna with slices of Aleppo Chili rubbed cantaloupe. Balancing out the heat of this dish with its crisp and refreshing taste was the 2012 Seven Hills Riesling. 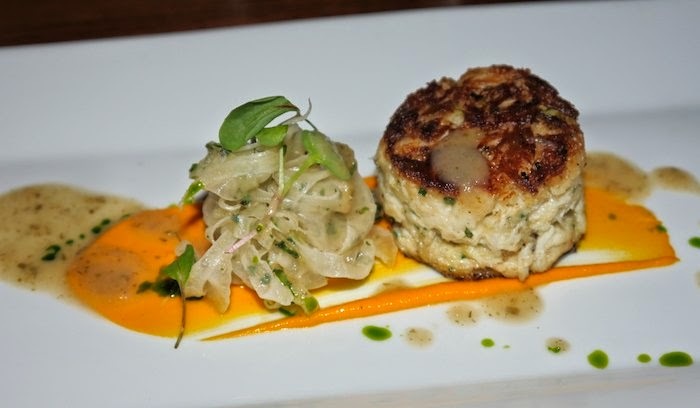 An intermezzo of house made coconut milk sorbet was followed by a crispy chive scented crab cake served with a shaved fennel & pear vinegar and a lemon carrot puree. The 2012 Seven Hills Pinot Gris, with hints of pear and citrus paired wonderfully. My favorite course of the night was the seared venison which was topped with a cherry port reduction and served with pureed sweet potatoes and rapini. The accompanying wine was the 2011 Seven Hills Ciel Du Cheval, a red blend of Cabernet Sauvignon, Merlot, and Cabernet Franc. 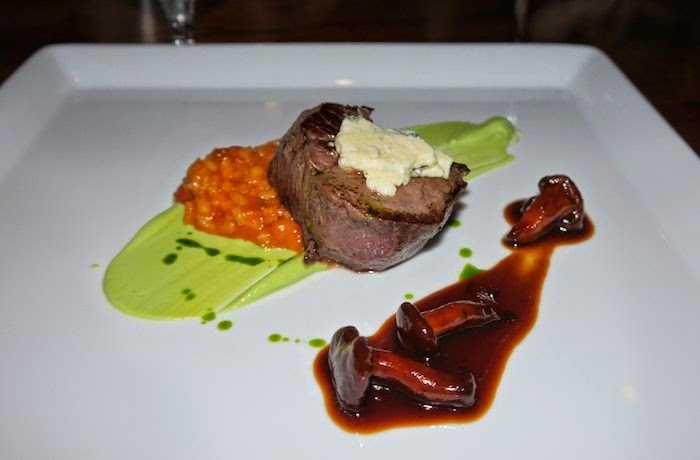 The next course featured a wagyu beef tenderloin that was basted with butter and topped with a tangy Point Reyes cheese. It was finished with a chanterelle mushroom reduction. The complexity of the 2011 Seven Hills Cabernet made it a great pairing for this dish. 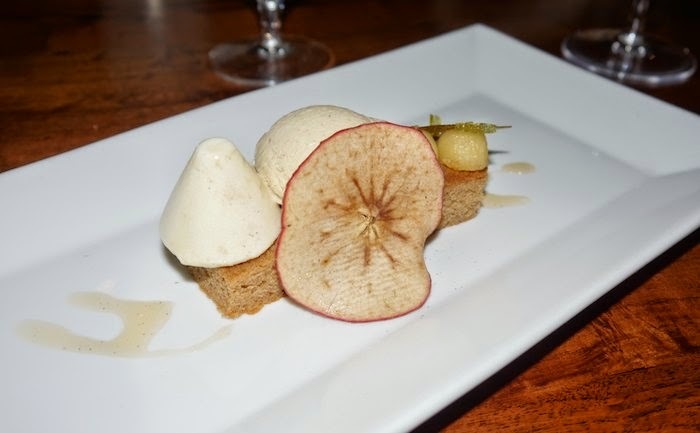 To top off this amazing dinner Chef DeMuro prepared a cider scented cane syrup cake topped with an apple Absinthe cream and spice apple ice cream. If you are looking for a fun interactive well done food and wine dinner I would highly recommend the Insider's View Dinner. Held monthly through May, dinners cost $99 per person. What a meal! And I'll bet it was made even more enjoyable by the fact that you were able to watch the chef prepare the meal. Yes! that made it extra special! Man, your food life is exciting!! I can only imagine how amazing this was! I swear woman, you eat like a queen, and I am royally jealous!!!!! All of that food is so beautifully plated!! I bet it tasted as good as it looks. What beautiful food! What a great evening. What a night! This looks like so much fun and that food is just gorgeous!! Sounds like a perfectly lovely evening! What a night and what wonderful food! Sounds perfect. That's so neat that you could watch the chef prepare the meal! I've never been anywhere like that. Such a fun event! Boy, does the food look terrific! I absolutely love this dinner idea. I think I would be mesmerized by the chef preparing all the delicious dishes. I wish that this dinner was here in South Florida! Each course looked delicious and how fabulous to have wonderful wines with each course. Wow - everything on the menu looks amazing...and the wine too! I love attending wine dinners too. And then recreating inspired dishes from what I ate! What a fun night you had!